We can help you refill your prescription. If approved by one of our providers, we can send your refill to your preferred pharmacy. We also offer same day delivery to most locations. Currently, DOC in a box only allows for 1 refill on medication if approved by the provider. Sign up using your phone, tablet or computer and complete a short questionnaire along with your payment. 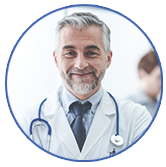 Select one of our U.S. board certified providers in your physical state. Choose if you want a call or videochat. 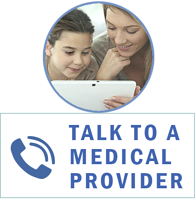 Your selected provider will contact you within 10 minutes. Limitations of Online Doctor/Medical Consultation and Online Prescription Refill. DOC in a box does not dispense, or resell any medications. DIAB (DOC in a box) is NOT a pharmacy. DIAB sends all prescriptions electronically and securely through SureScripts to each clients individual pharmacy. That pharmacy has the option to deliver the medication to DIAB clients. DIAB also does not dispense or prescribe narcotics/controlled substances (this policy is fully enforced by the Drug Enforcement Administration (DEA) for pain, anxiety, weight-loss, sleep, ADHD/ADD, anabolic steroids, testosterone replacement therapy and any medication that contains pseudoephedrine. Furthermore, DIAB is not a substitute for an office based physician in your location nor it it a substitute for Emergency Medical Care or 911. If you do experience a "true" medical emergency you are encouraged to pick up the phone and dial 911 as soon as possible. We work hard to not overuse antibiotics. We educate clients on appropriate use of antibiotics, and follow evidence-based guidelines. When used appropriately, antibiotics fight bacterial infections. When used inappropriately, they lead to resistance and the risk of unwanted side effects. Refills on antibiotics and other short term medications are NOT permitted. If your symptoms are not improving it is best practice to see the provider again to evaluate the change of condition and decide on an updated treatment plan. Repeated failure to follow providers' treatment plan can result in termination of our services.